When we dream of what our lives can hold, we should always dream with open eyes. We should always be aware of the pitfalls before us but, more importantly, we should open our eyes to the dangers that exist should we lack the courage to pursue our dreams. Once we understand our options, we’ll be better suited to do what we need to do to find happiness in our lives. 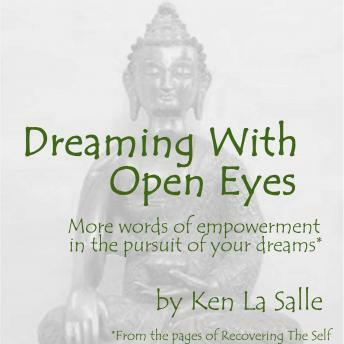 Dreaming With Open Eyes is Ken La Salle’s third collection of essays from the pages of Recovering the Self. As he shares his journey in the pursuit of his dreams, he spotlights the dangers and opportunities in the journey ahead of all of us. Only when we open our eyes can we see the truth of our lives. Dreaming With Open Eyes shows us just what riches our dreams and our lives can hold.